As we noted in the last post, we're all about people trying unicycling for free. So are our friends at #UnicyclesAreAThing. They are friends in real life and not just virtually (as many things go these days). And, while they are now one of the newest Unicycling Society of America affiliated clubs, they already have some positive press in the Post-Gazette Uni Story that ran recently. And though they are now a new official club, they've been functioning for a few years with the same mission as we have: get people to try unicycling for FREE! 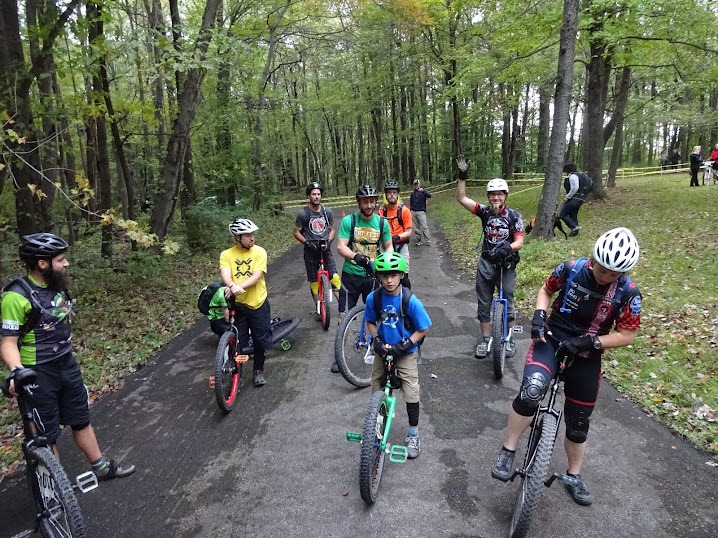 There's a good chance that if you're reading this and are in the Pittsburgh region that you've already had the opportunity to join them or us (Butler Wobble) to try riding. I know I've mentioned the FREE aspect a whole lot recently. As with anything though, there is a cost incurred somewhere by someone. In the case of almost anything in our society, there are times when liability insurance is necessary. If you have a home or a car, you know this exists. It's an American thing that people tend to get litigious in a hurry. And while you might not be that person, anytime there's something that involved a perceived risk, there can be a need to protect against that person who may try to sue. So. Here's what you can do about helping the unicycling cause. Please consider joining the Unicycling Society of America. It's only $20 a year for an Individual Membership or $35 a year for a Family Membership (all at the same address). If you ride with us (either #UnicyclesAreAThing or Butler Wobble), please specify us as your club when filling out the form. Having the people who ride with us and help us with demos members allows us to have liability insurance when we need it at no additional cost to any of our members. Neither Butler Wobble nor #UnicyclesAreAThing have any other dues to be members. If you ride a unicycle, you should join the Unicycling Society of America. They are interested in connecting unicyclists with each other as well as sponsoring events and supporting USA affiliated clubs. Seriously, if you've ridden with us, think just how awesome it's been to try something for free. How often else can you do that beyond a couple of initial classes. In the grand scheme of life, unicycling is cheap. Please help keep it that way. Consider joining the Unicycling Society of America. If you need a direct link to the membership page: it's here. We've been on a mission to get people to learn about the fun of one for free. So are our friends at #UnicyclesAreAThing. Please help us keep it that way. Your support helps us when we need insurance to be at events with unis so that more people can try unicycling. The last post was about 3 months ago. That DOESN'T mean we haven't been riding and active. Quite the contrary, we've just got a routine. And it's a pretty good one. From the Autumn Daylight Saving Time to Spring Daylight Saving Time we've got regular beginner (and everyone else is welcome too) FREE sessions at the Butler Y on Saturdays. We also ride Friday nights at The Wheel Mill indoor bike (and uni) park. But, it's not that time of year. It's early July. And since the last post we've had FREE uni demos at the Y's Healthy Kids Day. And we had FREE uni demos at Dirt Rag's Dirt Fest (PA version). We also had a pretty fun group ride there as well. On our advanced rider end, we also had a pretty fun reviewing of the NAUCC 2013 Marathon course one fun Sunday. We also raced 6 Hour's of Brady's Run as a wobble of uni solos. And there's been FREE beginner unicycling with #UnicyclesAreAThing every Friday night from 6:30-8:30 (weather permitting) sponsored by THICK Bikes at South Shore Riverfront Park in the South Side of Pittsburgh. And some are getting ready to head to NAUCC 2017. And after that we'll be racing the Month of Mud again in October. And then back to the Y and The Wheel Mill for another round of fun! SO- if you're looking for the most regular updates of where you can ride with us, you can find us on Facebook. Or, you can just look for us in person at any of the usual places at the usual times. Or, just send an email. Unicycling is fun for everyone! PS- If you're looking for more unicycling info, check out The Unicycling Society of America. We're one of the many affiliated clubs in the USA.